The image above was a high point of my summer. 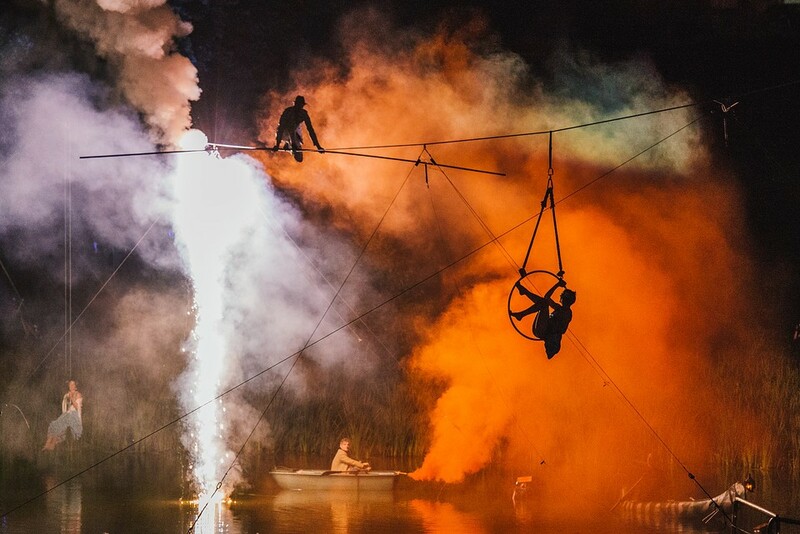 The finale to Shambala Festival 2014 was a joy to work on. On the tightwire is the fearless Chris Bullzini doing his longest walk at that time, 100m long at 80m high over a lake. The aerialist is Shaena Brandel. In the uncropped image, Phoebe Bullzini is suspended from the wire on a swing and Ben Osborne is in a boat with a distress flare tied to the back of it. On the shore, head rigger Barnz Munn and I were overseeing a true spectacle come to life while Ali operated the follow spot. A beautiful pyro show followed and we all celebrated. The next day was cold and wet, even wetter in the lake where the crew and friends were de-rigging from earlier than I was up. We made a curry, all got together for lunch and sorted out the cash in the caravan! Besides scrambling around in stinging nettles a few days before lying power lines, this was a total pleasure to work on.